Health chiefs and University lecturers are promoting a district nursing course that will meet a surge in demand and develop community staff. 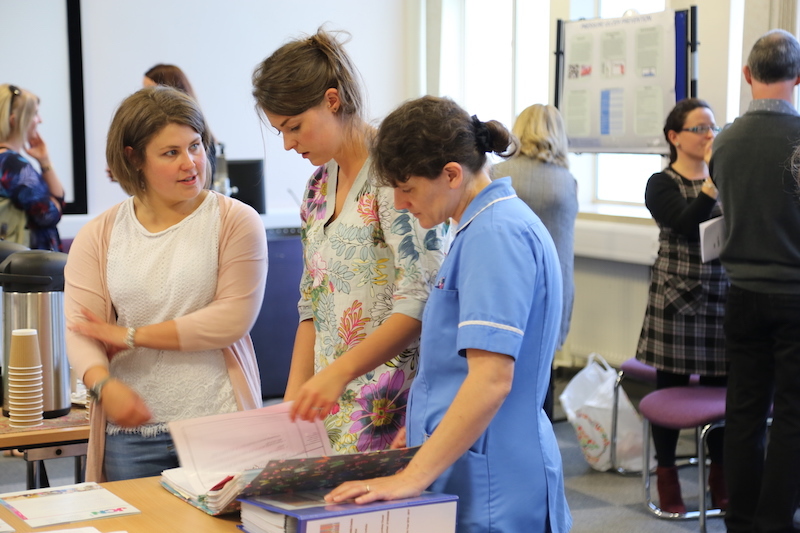 The Community Specialist Practice (District Nursing) programme at Wrexham Glyndwr University was formed in partnership with Welsh Government and educates the community staff nurses from across North Wales every year. The vast majority of students leave the two-year qualification having been promoted from their existing community nurse role to that of District Nurse Caseload Holder (Band 6) – with the likelihood of further personal development and many returning to complete their Masters in Community Specialist Practice. Locality Matrons Jayne Sankey and Liz Grieve are responsible for 25 teams of district nurses across North East Wales and Denbighshire, and work closely with Programme Leader Alison Williams – recipient of the Queen’s Nurse Award last year – and Senior Lecturer Victoria Graham to shape the curriculum. That industry-led ethos is part of the Wrexham Glyndwr mission statement, and is helping to meet a national shortfall of District Nurses. “There is a demand for district nurses because there are more and more people with complex needs in our communities that need to receive quality nursing care in the home,” said Liz. “We plan closely with the University because we know in which areas we are really going to need posts and that helps form the course so it is totally relevant to the issues we face and the work they will be doing. Alison echoed those points, and added: “The Locality Matrons across Betsi Cadwaladr University Health Board (BCUHB) and the District Nursing programme team work very closely together shaping the course and ensuring it closely matches the requirements within clinical practice”. The “cradle to grave” ethos of district nursing has never changed, according to Jayne, but the form of treatment has, which is why the district nursing programme has to be at the cutting edge of developments in the service to reflect changing need to support people in their own communities and to avoid unnecessary hospital admissions. “Elements of the job have never changed, the fact the communities in North Wales are quite well-knit and everyone will know who the nurse is, for example,” she said. One student who has progressed after graduating from the BSc is Vicky Roberts, from Mold, who spent 10 years at Mold Hospital before becoming a community nurse in 2014. The 35 year-old nurse has gained recent promotion and looks forward to a bright future within the service. “We deal with a lot of complex patients with complex needs and this course gives you more of an idea how to manage them,” she said. The students have all produced a poster demonstrating an Innovation in Practice as part of the programme and this was recently celebrated at Wrexham Glyndwr University with managers and community staff in attendance to share in the students’ success. For more information about the course visit the Wrexham Glyndwr University website. Read 1,127,623 times in last 30 days, and 73,931,824 times since we started in 2011.